Siena is the result of an obsession to simplify the user experience for photography, and help you radiate your beautiful photographs into a gorgeously clean portfolio. Portfolio: Siena comes with three different concepts for portfolio, each one is distinguished with a different set of features to cover every style. They differentiate from the minimal driven, to the beautiful cover layouts. Multi Concept: Siena is purposely built to be both beautiful and useful, it comes with a variety of page templates and concepts to fit every vision. Portfolio Variations: Increase your exposure with a gorgeous portfolio page. Use multiple images, video and customize the colors, background overlay. Responsive: Siena is built with responsiveness in mind. It looks and functions beautifully on both desktop and mobile. Colors Control: Siena lets you customize every title, every text and every button to fit your style and taste. Video Backgrounds: Create a powerful visual experience. Bring your website background to life with a video of your choice. Retina Ready: It looks awesome on Apple devices that have Retina Display, and all high resolution displays. Clean Code: We use a very clean set of codes that you will find super easy to edit and customize. Highly Customizable: Siena lets you personalize layouts, fonts and colors to create the custom look you want. Demo Content: To help you setup your site, Siena comes with the ability to import the content from the demo site to make it look exactly like it. Regularly Updated: Siena is Regularly updated with new features, new customization tools and general improvements and bug fixes. Added: Ability to choose whether to display EXIF title and caption or manually enter them. Added: Ability to choose whether to show EXIF metadata or manually enter different details other than technical details. Improved: Refined attachment page for images. Added: Shopify Embed integration (now you can link your photographs and videos to products on your Shopify store and sell them right on your website). Added: Portfolio albums carousel page template. 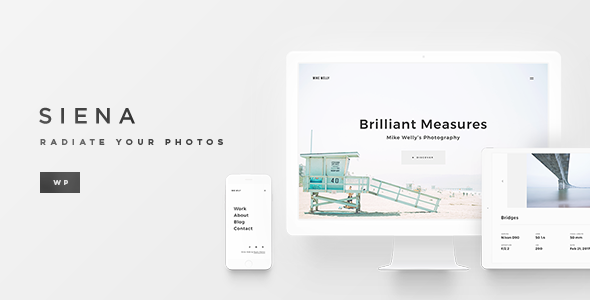 Added: Home with photographs page template. Added: 16 new text animations for home page template. Added: Ability to add description text to photographs above the details. Improved: WYSIWYG editor for about page template. Improved: More tools to customize the fonts. Other: General improvements and bug fixes. Added: Ability to customize the photograph details typo. Added: Ability to set video poster on the home page. Minor bug fixes & general improvements. Added: Ability to show/hide title on photograph page. Added: Ability to show/hide date on photograph page. Added: Ability to show/hide album on photograph page. Added: Ability to show/hide details on photograph page. Added: Ability to enable/disable social sharing on photograph page. Added: Ability to customize the typography. Improved: General look and feel on mobile devices and tablets. jQuery (by The jQuery Foundation). jQuery Mobile (by The jQuery Foundation). jQuery throttle (by Ben Alman). Font Awesome (by Dave Gandy).